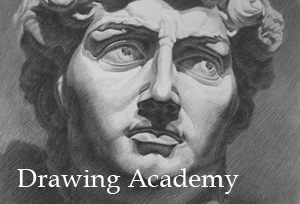 The Golden Ratio (also known as golden mean, golden section (Latin: sectio aurea), extreme and mean ratio, medial section, divine proportion, divine section (Latin: sectio divina), golden proportion, golden cut, and golden number) is the formula that rules arts. This ratio can be expressed as follows: The whole is to the larger in the same proportion as the larger is to the smaller. It was described mathematically by Euclid of Alexandria (325-265 BC), who divided a line into its “extreme and mean ratio”: A straight line is said to have been cut in extreme and mean ratio when, as the whole line is to the greater segments, so is the greater to the lesser. 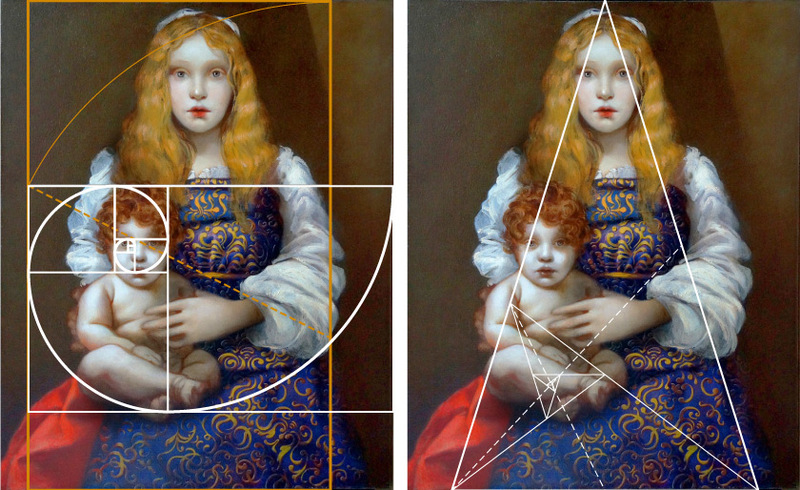 The value of the golden ratio, which is the limit of the ratio of consecutive Fibonacci numbers, has a value of approximately 1.61803. 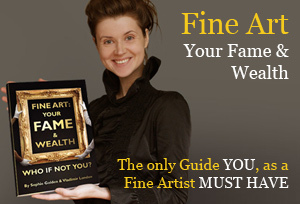 Art reflects the nature and the inner world of an artist. 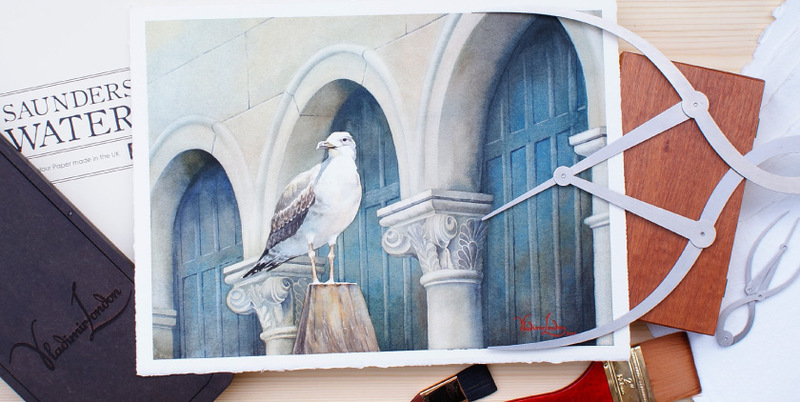 What we perceived as beautiful, well-proportionate and balanced in nature, finds its way into fine art, following the same rules of divine proportions that universe has. 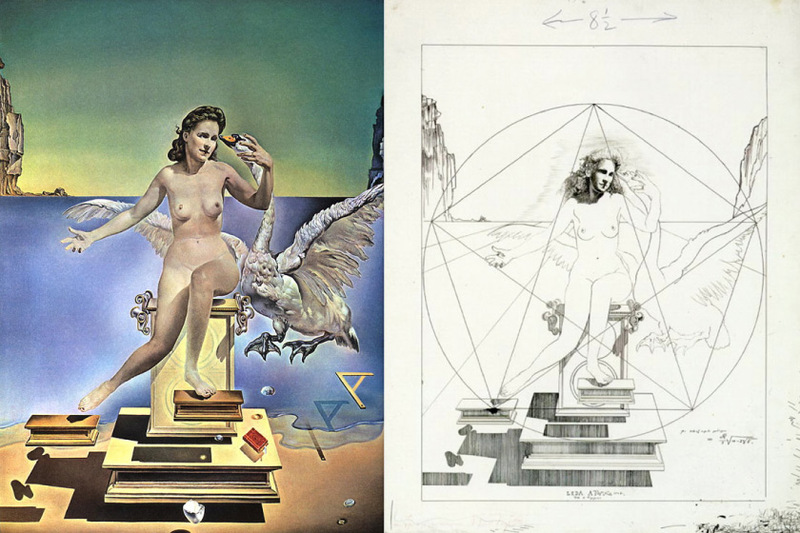 The relationship of balance, principles of harmony, and symmetry all present in the best works of fine art. 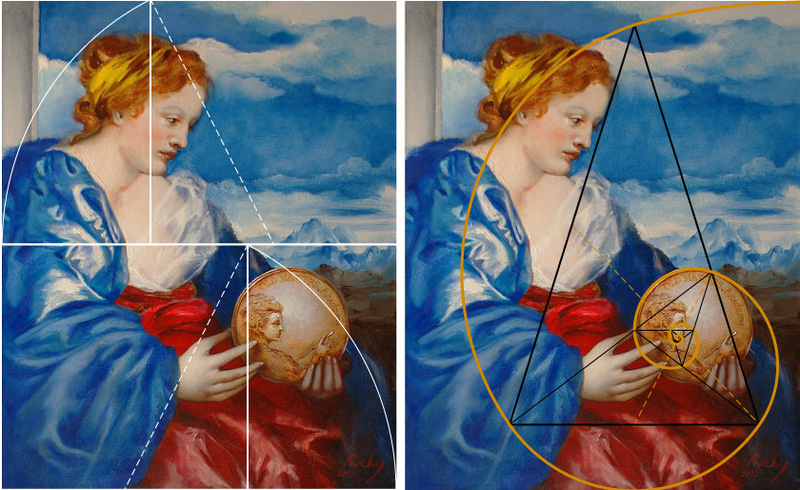 So, understanding and using the golden ratio is important for any artist. 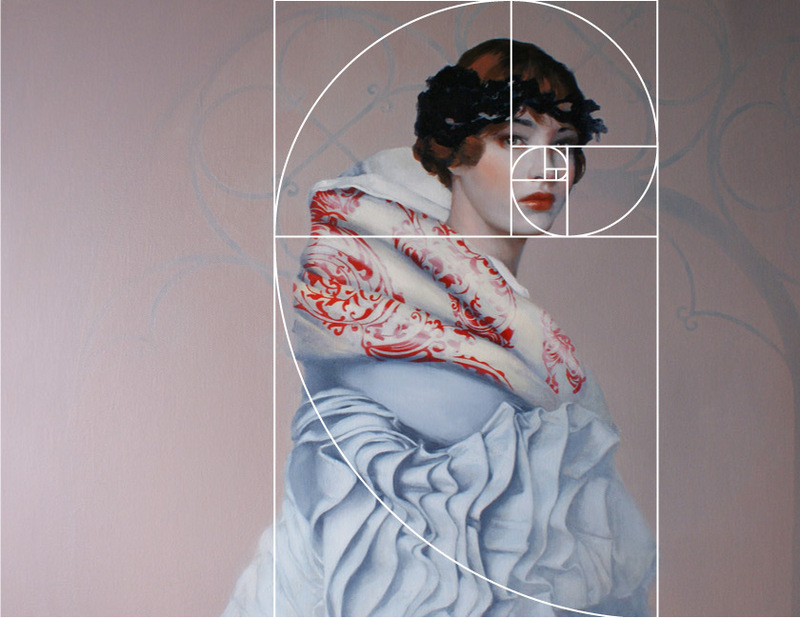 There are unlimited considerations for an artist to use the golden ratio. 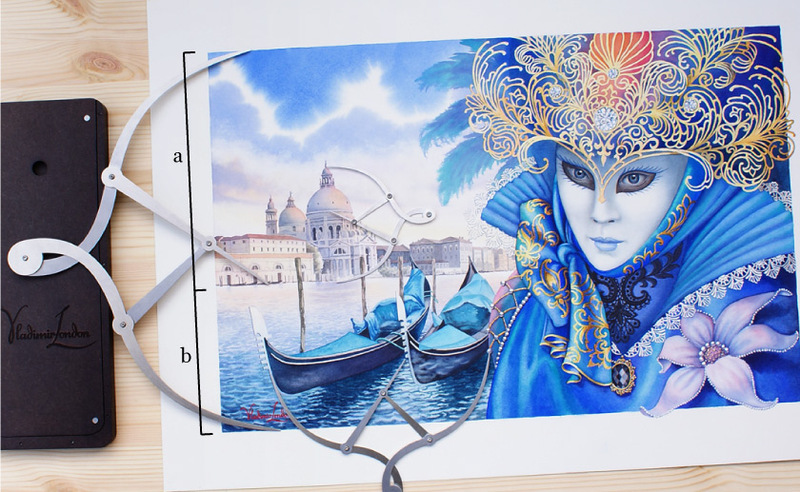 The divine proportion can be implemented to divide a canvas according to overall design and content, draft a composition of the whole artwork or its parts, balance tonal values or colors. 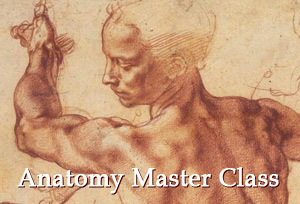 In order to balance the elements of color, movement, and content within the shape of the canvas, key attention points or shapes are placed in certain relationships with other key points. Whether this is done according to some inner sense of harmony or it is calculated is something only the artist will know. As observers we can appreciate the final result by overlaying shapes of Divine Proportion to increase our awareness of the overall dynamics. 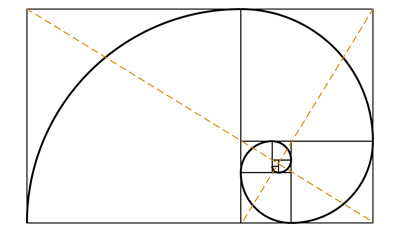 The Golden Ratio is based on a relationship that says the whole can be compared to a longer section in exactly the same way that the longer section can be compared to a shorter section. (1 + √5) / 2. The Golden Spiral is a logarithmic spiral or equiangular spiral is a special kind of spiral curve that often appears in nature. 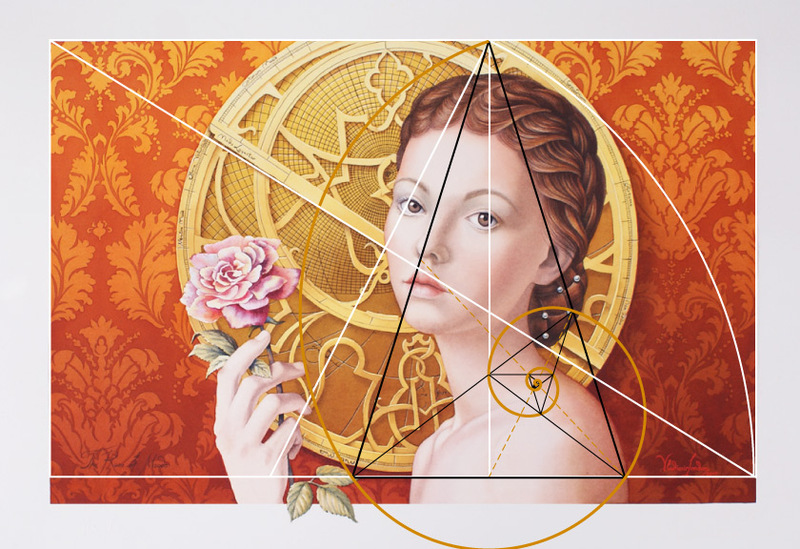 The Golden Spiral is a particular version of this spiral that is based upon the Divine Proportion. The Golden Triangle is an isosceles triangle with ratio of the Golden Proportion between its side and its base. Two angles at that base are 72 degrees; the angle at the apex is 36 degrees. 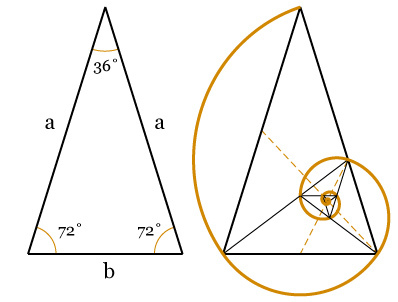 This triangle has a unique property – it can be broken into two smaller triangles that are also Golden Triangles.